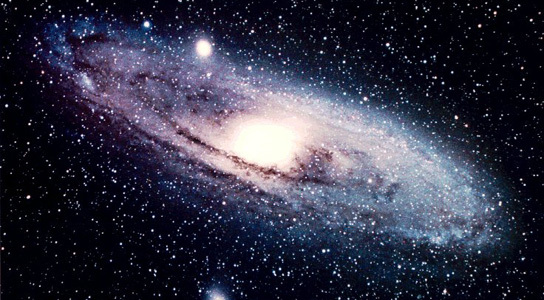 While it’s a well-known fact that there’s an upcoming Andromeda-Milky Way collision in 3 to 5 billion years, Stephen Hawking has stated that we should look to a collision between universes in the distant past of our own universe for explanations of why physical constants seem so fine-tuned to the values required for life to exist. Stephen Hawking thinks that the best way to see this is to further develop M-theory, an extension of string theory. M-theory predicts many different universes, with different values for the physical constants that we take for granted for. A way to check for evidence of the many different universes is to look for features in the cosmic microwave background radiation (CMB), which could show that our universe collided with another universe billions of years ago. The circular patterns within the cosmic microwave background seem to indicate that space and time did not come into being at the Big Bang, but that our own universe continually cycles through a series of “aeons”, states University of Oxford theoretical physicist Roger Penrose, who believes that the data collected by NASA’s WMAP satellite supports his theory of conformal cyclic cosmology. 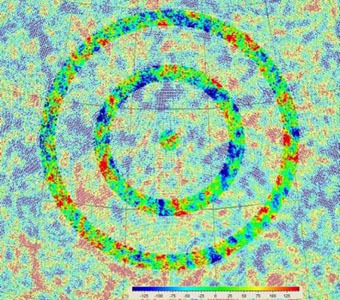 Penrose made this claim after having analyzed maps from the Wilkinson Anisotropy Probe, which reveal that the cosmic microwave background may have been created just 300,000 years after the Big Bang, thus offering an insight to the conditions at that time. This counters the traditional model which has become accepted, that the universe rapidly expanded for a short time before settling to a slower rate of expansion. This model does not account for the very low entropy state in which our universe was born. Penrose believes that the Big Bang was just one of many Big Bangs, which each marking the beginning of a new “aeon” in the history of the universe. According to Penrose and Vahe Gurzadyn of the Yerevan Physics Institute in Armenia, the concentric circles allow us to see through the Big Bang in the aeon to the one that might have existed beforehand. There is a visible signature left in our aeon by the spherical ripples of gravitational waves that were generated when black holes collided in the previous aeon. This theory is not without critics, because it states that the distribution of temperature variations across the sky should be Gaussian, or random, rather than having discernible structures hidden within it. Another problem which arises, and since it’s central to the theory, it’s quite important, is that all particles will become massless in the very distant future. However, there’s no evidence that electrons decay in that fashion. 2 Comments on "Our Universe Collided with Another Billions of Years Ago, Stephen Hawking States"
for a very limited human being, that just got here 2 seconds ago there seems to be only one reason for all that matter in the uni/multiverse.combine it with spirit and you get love and life.anyone with a better idea? What the hell does that even mean, Hans? “combine it with spirit and you get love and life”??? That kind of ridiculous illogical thought process doesn’t have any kind of scientific critical thinking anywhere in sight.